The full fibre roll-outs are starting to ramp up and after numerous reports of people seeing the build activity but not being able to order we have finally found an exchange area in Liverpool where people now have the option of full fibre. The Childwall area of Liverpool now has a good concentration of FTTP that is live and there may be more to come. While most of the addresses enabled already had good speeds via VDSL2 or cable broadband services there are some who have moved from exchange only lines or their cabinet did not have a VDSL2 twin. The live postcodes we know about are in our package search and on our maps. The Fibre First roll-out from Openreach is aiming to deliver three million premises passed by full fibre by the end of 2020 (i.e. in just under two years) and with 1.7 million of these expected to be existing premises in cities and towns there is clearly going to be many more areas like we have found. The pace of the Openreach FTTP roll-out now means we have 702,070 premises in our checker and a total of 2,094,398 ultrafast premises once you add the FTTP footprint. 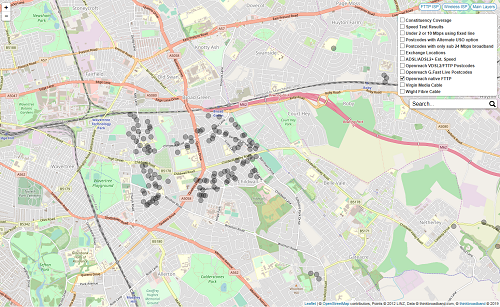 There is clearly a lot of work to do but the last few weeks has seen a big increase in the rate at which we are spotting FTTP with some 47,713 premises found in the last 17 days, these additions are a mixture of new premises, Fibre First and delivery under the rural contracts. The roll-out seen so far in Liverpool may only have taken the Openreach FTTP coverage for the council area to 1.4% but once other areas are found the percentage will climb. Additional areas in Bristol have been spotted with Openreach FTTP and there seems to be a difference in how the roll-out is happening, the Childwall area appears to have gone live in one large lump but the roll-out in Bristol has been more piecemeal. We covered Northern Ireland and its FTTP roll-out the other day and we continue to find more FTTP there with the Openreach figure rising from 8.5% to 10% in just a few days. If the pace of roll-out we are currently seeing is maintained Openreach is almost on course to reach its 3 million target by the end of 2020. Most of these already had Gfast available some at 330Mb max,some where out of distance, none of those I checked were EO.